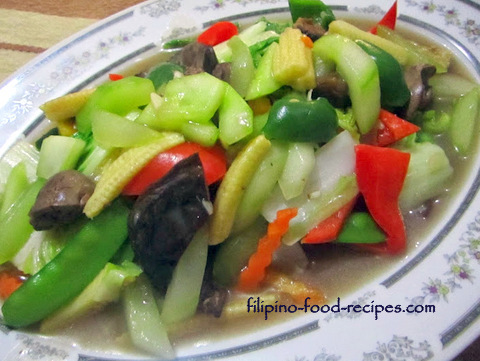 Chopsuey with Cucumber is a variant of the popular dish Chopsuey, a favorite local fare of mixed vegetables in a flavorful thick sauce. I have tried it years ago from a Chinese restaurant in Mandaluyong City and I thought I wanted to remake it. It had the familiar taste of the regular chopsuey with all the carrots, snow peas and the chicken and chicken liver but the cucumber gives it a nice, refreshing twist. I remove the cucumber seeds to make it less watery. I cook the vegetables in stages, like the carrots and young corn go before the rest of the vegetables because they need more time to cook than the rest. I also prefer the vegetables to be slightly crunchy and bright colored rather than soft and mushy. Try serving it to your family without telling them that you added cucumber, and see if they will be able to tell! 1 Saute the garlic, onion and ginger in oil. 2 Add chicken, chicken liver and shitake mushroom and saute for 2 to 3 minutes. 3 Flavor with fish sauce and add the Chinese cooking wing. 4 Add the carrots and young corn and cook for 2 minute. 5 Add the remaining vegetables with the broth (or water with Knorr cube) and bring to a boil. 6 Season with salt(if needed) and pepper and thicken the sauce with cornstarch slurry. 7 Serve with steamed white rice.